I’d never had curry until a year or so ago. I just couldn’t get past the smell – or at least the smell of the tub of curry powder my husband bought at Costco when we were newlyweds. Fast forward to about 18 months ago…we were still living in Florida…when a dear friend whose father is from India and who spends time there each year took us to his favorite restaurant. Our entire family, including the super-picky boy, became fanatics for the flavors of India. We’ve enjoyed meals out at Indian restaurants ever since, but it’s only been recently that I’ve finally begun using the flavors at home. It’s been a bit intimidating, but I think we’re getting the hang of it. This one pan meal is the end result of just playing around and experimenting a bit. It’s really easy to adapt to your personal needs for spice and texture, and it would be easy to substitute beef or even shrimp for the chicken. Don’t like mushrooms? No problem, just skip them. Prefer a red chili paste? It works too. Want to add in some other veggies? Why not. It’s a great template to work from, and one that we’ve been playing with quite a bit. Really, the only thing I think is a necessity is the cauliflower. By steaming the cauliflower and then allowing it to finish cooking in the curry/coconut milk liquid, it takes on a bit of that risotto texture that I miss so much. I like mine a little thicker, so hubby adds more coconut milk after I pull mine out of the pan. I’m working to find ways to make more of my recipes quicker to throw together. I’m planning to try steaming, draining and freezing the cauliflower in advance this week. If it works, I’ll update the recipe. You could also easily used precooked chicken or beef to speed things up a little more. Once the chopping and grating was done, it only took us about 20 minutes to put this together – quick enough for a good lunch and perfect for a busy night dinner. If nothing else, make a double batch. The leftovers just get better. Steam grated/riced cauliflower in the microwave or on the stove with a bit of water for 3 or 4 minutes. You want to just take the crunch off of it, and don’t want it fully cooked. Transfer cauliflower to a strainer and allow to drain for 15 minutes. You can pull a little more water out by adding a sprinkle of salt to the cauliflower. Mix chicken with 1 t. of the vadouvan and set aside. Combine curry paste and coconut milk. I like a ratio of 1 paste to 2 milk – my preference with this yellow curry paste is 1.5 T. curry paste and 3 T. coconut milk, but that can depend on how much cauliflower you have and personal preference. In a large frying pan over medium high, heat 2 T. coconut oil. Once the oil is melted, add the rest of the vadouvan and allow to heat for just a moment until it becomes even more fragrant. Add the mushrooms and onions. Cook until the mushrooms are tender and the onions are just cooked, just a few minutes – they’ll continue to cook later. Remove to a bowl. Add the rest of the coconut oil, and then the chicken chunks. Brown and cook the chicken. Transfer the cauliflower rice from the strainer to the frying pan, tossing with the chicken to combine. Pour in the curry paste and coconut milk, turn the heat down and allow to simmer. After a minute or two, add the mushrooms and onions as well. This is where you have to use your own judgement – you’re going to need some more coconut milk, but add it slowly (i.e. don’t dump it directly from the can…not that I’m speaking from experience). A tablespoon at a time. It’s also helpful to taste some of the cauliflower bits. If they’re super spicy, more coconut milk helps tone it down. A dash of fish sauce or coconut aminos adds another flavor to the mix that can be nice. 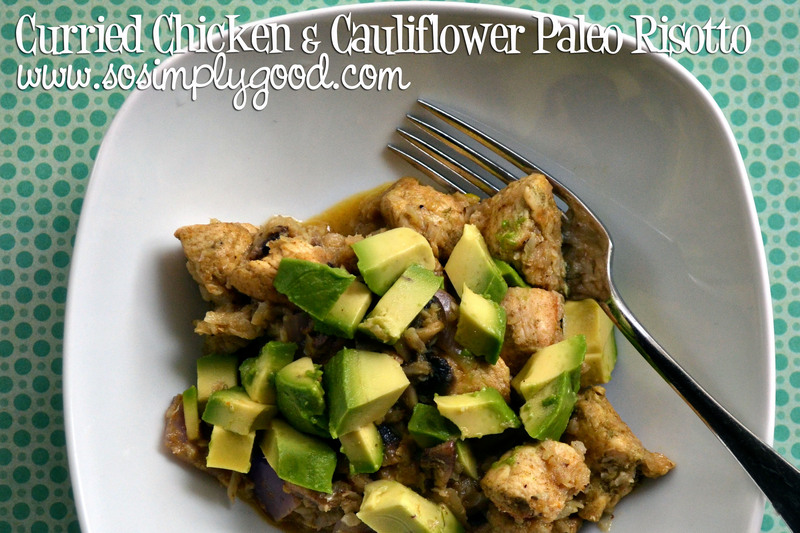 One of the greatest benefits of going paleo for me has been getting to experience new flavors – I hope you enjoy this one as much as we do! This entry was posted in Simply Yummy and tagged ancestral recipes, curry, paleo recipes, primal recipes, vadouvan, Whole30 recipes by Awkward Girl Gets Fit. Bookmark the permalink. this looks delish! i love curry and all things indian-spice! cannot wait to try it…thanks for the link to the curry paste!